Written sometime between 1205-1214 for monks at the abbey of Locedio in the diocese of Vercelli in northern Italy, these homilies were re-discovered in the seventeenth century and promptly attributed to another, far more famous Cistercian, Bernard of Clairvaux. 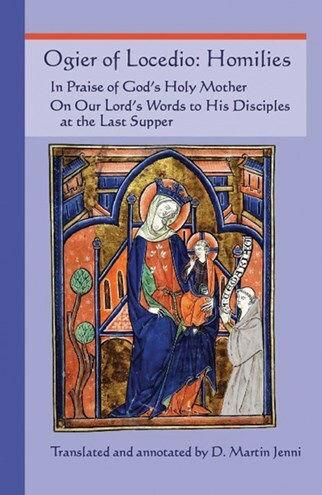 In both style and doctrine, 'In Praise of God’s Holy Mother’ and 'On Our Lord’s Word to His Disciples at the Last Supper’ reflect a devotion somewhat dissimilar to and slightly later than Saint Bernard’s. D. Martin Jenni, Professor Emeritus of the University of Iowa School of Music, has distinguished himself as a composer, a teacher, and a scholar. Deeply familiar with the Latin chant of the Middle Ages, he has also studied the theology and literature of the period. Here he brings into modern English the long overlooked works of an almost forgotten medieval Cistercian spiritual writer. The homilies, in fact, offer a deep and rewarding spirituality and well repay meditative reading, or what Ogier, naturally, would call lectio divina. That, after all, was their purpose. As to the translation itself-the first in English-it is accurate and elegant, sometimes very elegant indeed. The commentary is beautifully written. . . a very deep and personal love for Jesus is the hallmark of his writing. . . . I gathered some friends together and read [the Planctus Mariae] out to them, expressing as best I could the emotions that the author was trying to convey. My friends were all deeply impressed with the homily and at times almost moved to tears. This suggested to me that the language used was still powerful enough to make a deep impression even on a modern reader.